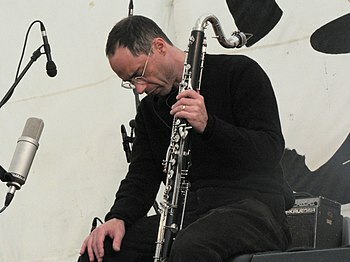 John Butcher has been a singular force in experimental saxophone for over 30 years. 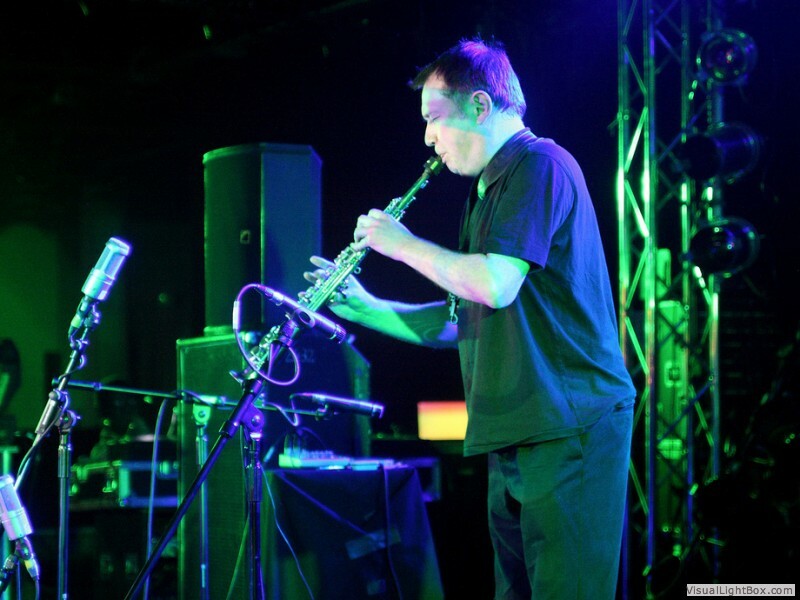 His specialties include evokes drones, hums, and buzzes out of a sax, as well as amplifying his instrument. John recently answered a few questions from AMN. Your career path is a fairly unique and interesting story – you earned a Ph.D. in physics and then set that aside to be an improvising musician. How did this transition occur? Were you active in music when you were engaged in academics? I’d been making music since my mid teens, so it had always coexisted with the physics work. I never thought of any of this as a career though, it was just doing stuff I wanted to do. There was no plan. Mind you, I expect quantum chromodynamics and freely improvised saxophony is a course option somewhere now. Anyway, most things in life happen at the wrong moment, and by the time I started the Ph.D I pretty much wanted to focus on music. I tried to meet more players who we’re looking for the things that are hidden around the corners. But this was also the start of the Thatcher years. Clearly an ideal moment to dedicate yourself to unpopular, unpaid, experimental music. After the doctorate I taught part-time for years, and slowly the musical possibilities expanded and the teaching contracted. Have you kept up with physics at all? I’ll read some of the non-specialist books now and then. A number of your recent recordings are solo sax, duets, and small groups. Is this part of a “less is more” philosophy, or just how events turned out? Well, last year I did concerts with Anemone (5 piece), Cranes and Freighters (7 piece) – but you’re probably right. Generally I prefer small groups. You can hear the people behind the ideas, larger groups usually need pre-structure, pre-composition. Your solo sax recordings are rather engaging, with what seems to be a fairly well-considered “structure” accompanying an extent of improvisation. How preconceived are these efforts? Not at all, except in the sense that I enter the process with a memory of past solo concerts. But I try to start with an empty mind, and usually feel equally as though I’m leading and also am being lead during the event. Years ago I used to map things out more, but soon found that “better” ideas than the ones I’d planned suggested themselves in the actual performance. I try to remain open to the uniqueness of every situation. I recently listened to Bell Trove Spools again, and noted the diversity of sounds you managed to attain from your instruments. Did you also use the acoustics of these rooms in those recordings? You can’t not use the acoustics you play in. It’s a matter of degree. How much you try to change the actual material of your music according to the space you find yourself in. An orchestra playing Beethoven has to adapt to the acoustics of the space – but an improviser can, in principle, change the very form and content for each different acoustic. Make pieces specially for a location. Any upcoming performances or recordings that you’d like us to know about? I’ve just finished constructing this “Tarab Cuts“, project, with 4 shows coming up in Bristol, Glasgow, Amsterdam, and Barcelona. Duo CDs with Fred Frith, and Andy Moor soon. Also Anemone (Peter Evans, Paul Lovens, Fred Blondy, Clayton Thomas). Plan to tour with The Apophonics (John Edwards, Gino Robair). An evening of improvised duets featuring Marina Rosenfeld closes electronic composer Ben Vida’s 2013 residency. A leading voice in the increasing hybridization between the domains of visual art and music, Rosenfeld performs on turntables. Vida plays a digital/analog hybrid synth. Bring your bouquets with you for this special Valentine’s Day show! Combining a palette of sources from early Chicago house mixtapes through to musique concrète and psychedelia, Heatsick has made waves internationally with live dance music that expands and unlocks the senses. Ned Rothenberg performs solo improvisations, engaging a range of wind instruments as melodic, rhythmic and harmonic engines. ISSUE Project Room is proud to present legendary folk artist Dave Bixby in his first New York concert. Absent from the scene following the Michigan recording of two haunting private-press LPs in 1969, Bixby was rediscovered in 2006 near the Grand Canyon, now working as a Civil War re-enactor. Tonight at ISSUE he gives a rare performance of his timeless, now-iconic records “Ode to Quetzalcoatl” and “Second Coming” in their entirety— lost gems of soul-searching psychedelic folk. Esteemed American composer, musician, educator, recording artist and philosopher Anthony Braxton will celebrate his 69th birthday with a series of premieres, performances and events encompassing every facet of his decades-long career, from improvisational pieces with small ensembles to full-scale orchestral works and operatic compositions. Taking a cue from Braxton’s “Tri-Axium” philosophical writings exploring the “partials” of his life’s work-music (sound logic) systems, thought (philosophical) systems, and ritual and ceremonial (belief) systems-the decision to celebrate his 69th birthday publicly (a number divisible by three) is a natural one. The season will pair rare performances of past compositions with premieres and recordings of new work by the prolific MacArthur Fellow, Doris Duke Performing Artist and recently-named NEA Jazz Master, simultaneously paying tribute to Braxton’s career so far and looking forward to what’s to come. New York City non-profit Search and Restore presents three nights of Minneapolis-based drummer Dave King at Brooklyn’s ShapeShifter Lab, with five various projects — featuring Tim Berne, Reid Anderson, Chris Speed and Matt Mitchell. On February 16, the Lost Civilizations experimental music project, Utenzil and Australis will appear at Adams Morgan’s Black Squirrel. The performance is part of Anders Thueson‘s Indie Adams Morgan series (http://www.indieadamsmorgan.com/). Australis (https://www.facebook.com/australisband) is an alternative rock based musical partnership based in Washington, DC and founded by brothers, Andrés and Felipe Gallego. Growing up with a shared passion and dedication to music, underlined by a sibling competitiveness that pushes each other’s creative limits, Andrés and Felipe have come up with a sound that blends a plethora of influences (including folk, jazz, latin, classical, and pop) into a style of music that is both radio-friendly and layered in its composition that even seasoned musicians will be engaged, inspired, and entertained. The Lost Civilizations experimental music project (http://lost-civilizations.tumblr.com/; http://goo.gl/WfSs5) is a collaboration between Mike Sebastian (tenor sax, saxello and bass clarinet) and T. A. Zook (basscello and misc. instruments). Although essentially a duo, when schedules permit, it is joined by Jerry Busher (drums); Amanda Huron (percussion); Doug Kallmeyer (bass and electronics), Nate Scheible (percussion) and Emily Chimiak (violin). Utenzil (http://www.utenzil.com/) is the solo project of Michael Mc Morris, which brings together fitful decades of musical experience/experiments plus software, laptops, mixer and instruments which include various controllers, a DIY double neck midi guitar, live guitar and voice.